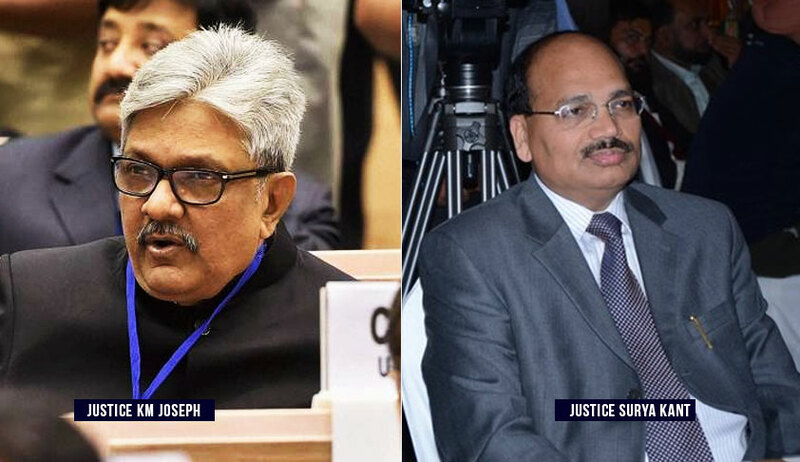 Judicial Appointments: Are Centre's Claims On Lack Of Seniority Of Justice KM Joseph And Justice Surya Kant Valid? The Centre has reportedly blocked the recommendations of the Supreme Court Collegium to appoint Uttarakhand high court chief justice K.M.Joseph as a Judge of the Supreme Court and Justice Surya Kant of Punjab and Haryana high court as Chief Justice of the Himachal Pradesh high court. Although there is no official confirmation of that report and the Centre has not returned the recommendation to the Collegium yet for its reconsideration, reports appearing in the media suggest that the Centre has certain reservations about these recommendations. LiveLaw answers the questions that readers may have on this controversy, as it has unfolded so far. Q: The present recommendations to elevate Justice K.M.Joseph and Justice Surya Kant were sent on January 10. Yet, the Centre is neither returning them for reconsideration by the Collegium, nor going ahead with these appointments. Does the Centre have the option to sit over the Collegium’s recommendations and take its own time to process it? A: The existing Memorandum of Procedure (MoP) is very clear. Paragraph 3.5 says after receipt of the final recommendation of the Chief Justice of India, the Union Minister of Law and Justice will put up the recommendations to the Prime Minister who will advise the President in the matter of appointment. It does not envisage any inexplicable time gap between the submission of the recommendation by the collegium and the Centre’s duty to act on it. Q: The Centre is reportedly of the view that Justice Joseph does not enjoy seniority in the all-India list, an important criterion for selection. Is it a valid claim? It also said that the legitimate expectation of the High Court Judges to be considered for appointment to the Supreme Court, according to their seniority” must be duly considered. This, seen in the context of what the Collegium said in its resolution on January 10 with regard to the outstanding merit of Justice Joseph, is clear that the Collegium is aware of his position in the all-India seniority list, and yet recommended him, in view of his “outstanding merit”. The Collegium said: “Justice Joseph is more deserving and suitable in all respects than other chief justices and senior judges of the high courts for being appointed as SC judge”. While recommending the name of Justice Joseph, the collegium took into consideration combined seniority on all-India basis of chief justices and senior judges of High Courts, apart from merit and integrity. Q: According to law ministry sources, cited in the news report, Justice Joseph was 12th in the list of seniority of CJs of 24 high courts, and at the 45th position in the all-India Judges’ seniority list. The “legitimate expectation” of the high court Judges to be considered for appointment to the Supreme Court in his turn according to his seniority, has also been cited by the ministry. What is the basis of this claim? A: The paragraphs culled from the Second and Third Judges cases, reproduced in the answer to the previous question, are an answer to the Centre’s contention. Therefore, the Centre’s defence is no defence at all. Rather, it is a distortion of what the Supreme Court had held in these cases. Q: In the case of Justice Surya Kant, it appears, some Judges of the Supreme Court feel that Justice A.K.Mittal, who is senior to Justice Kant, was superseded unjustly. Justice Ashok Bhan, a former SC Judge, has apparently written a letter to the Centre slamming the Collegium for superseding Justice Mittal, on the basis of an Intelligence Bureau report of 2003. Justice Bhan has disclosed that the IB report was discarded by the then collegium headed by the then CJI, V.N.Khare. The High Court Collegium too favoured Justice Mittal’s appointment to the high court, Justice Bhan has disclosed. Justice Adarsh Kumar Goel, a consultee Judge has apparently sought taking a fair view of the assets acquired in Delhi, Shimla and Punjab by Justice Kant, after becoming a Judge. Is the Centre justified in blocking Justice Kant’s elevation, based on these facts? The resolution, it may be noted, is silent on the 2003 IB report on Justice Mittal, which Justice Ashok Bhan has cited in his letter to the Centre. Secondly, the Collegium has also kept the doors open for considering Justice Mittal, for suitable elevation, later. Justice Surya Kant retires on February 9, 2024, while Justice Mittal retires on September 29, 2020. Both were appointed as Permanent Judges on the same day, January 9, 2004. Q: Why is the Centre not returning the recommendations for reconsideration by the Collegium, if it has some reservations? Sitting on the recommendation of the collegium, as the Centre is doing now, is certainly not an option for the Centre. Had the Supreme Court anticipated this in the second and third Judges cases, it would have considered laying down some time limit for the Centre to act on the recommendations. The Supreme Court’s judgment in the National Judicial Appointments Commission case in and the consequential judgment in the Collegium reform, in 2015, too did not anticipate that the Centre could adopt a confrontationist approach vis-à-vis the collegium’s recommendations. As many senior advocates in the Supreme Court feel a solution to this stalemate could only be found if the Court takes note of it judicially, and takes remedial steps.